Welcome to the Shoda League! It looks like you took on one of the harder gyms to secure your first victory. You have won the Sandhog Badge, just don't go thinking it can be made into Bacon. Err, this is kinda embarrasing for my part. Impressive, the Gates of Hell will be closing now, you've earned it. The Igneous Badge is all yours, gaze upon the heat of it's majestic flames. Congratulations, you deserve the Doom Badge! Take it with Gratitude! 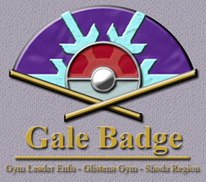 I'm not a GL anymore, but I guess you deserve my badge. Nice win.